And since my brain is completely fried after 3 hours of laying out the newsletter, I'm going to leave it at that. And with it, I'll toss a penny in the well with the wish I can finally, somehow, manage to get back to this space more often! The cartoon is hilarious. I always felt that way at a new job. People love to take advantage of your newness! But you will get a routine down soon! Moscow, how fun!!! I am sure that you feel overwhelmed at the new job but I think we all feel like that when we first start. Love that you are actually excited to get up and go in! That feeling cant be bought!!! Glad you are hanging in there! It will get better. How is your Whole30 lifestyle going? Mine is a little pathetic at the moment but still hanging on! Oh my gosh, that comic! I'm glad you're still loving your job- even with all the craziness! 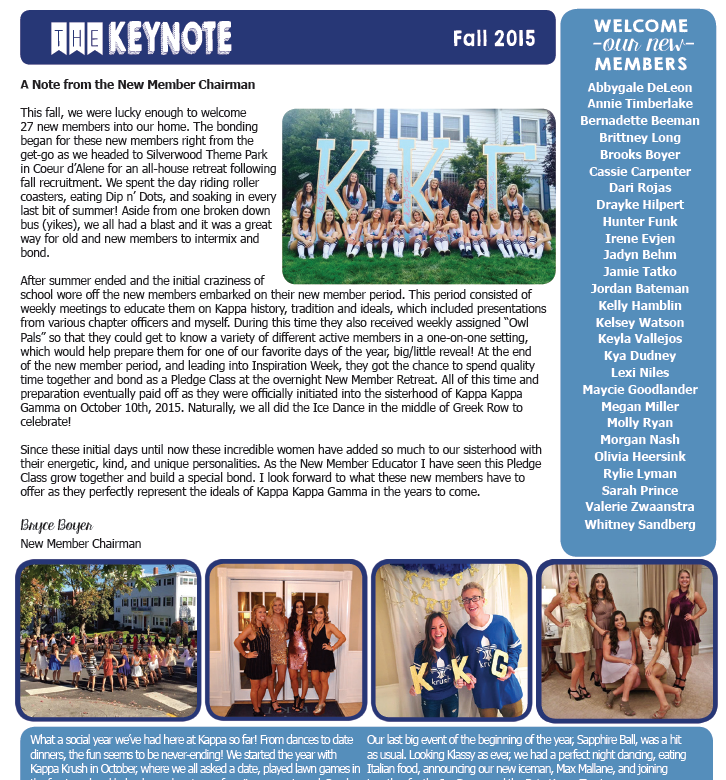 The newsletter looks awesome! The newsletter looks great. I am still involved with my sorority too and it is so rewarding. Have fun heading back to campus! I hope you can adjust soon! Your new job is lucky to have you! I miss your posts :) happy Wednesday!!! oh, girl....the project drowning -- i hear that. it's been like that for me ERRDAY since i started in NOvember!! hope things ease up for you soon. My best girlfriend and I were talking earlier this week about work/life balance. It ain't easy. I hope you just feeling a little more balanced very soon! It's so tough to find time for blogging. After work I totally have no energy and half force myself to get a post out or comment/respond to emails. You'll find your groove soon with work and blogging. How fun about going to Moscow for that milestone! I didn't know you were an advisor for your sorority! I always debated doing that for my alma mater but never had the time to commit.